Congratulations on your new website. If creating a website was among the first things you did to get started when launching your private practice, you are now in the ready to start getting traffic. And hint: traffic is key to getting clients through your website. Why You Should Focus On Getting Traffic First? Websites are the centerpiece of most digital marketing strategies. In the simplest of form, digital strategy is what gets you discovered so clients will reach out. Get traffic and get clients. Digital marketing is more than just a website though. Digital marketing includes a wide and multi-channel array of tools and activities for marketing your services online. Digital strategy’s umbrella includes strategies that help with all aspects of the client’s online journey to your doorstep. For instance, part of digital strategy is building an excellent website. So if you are just launching your freshly created website, you’ll have the website part done but not the website traffic part. So the priority focus of your digital strategy at this point is getting traffic to your site. In order to focus on getting traffic, you want to focus on the digital marketing activities that are the best for building traffic and referrals to your site. If you start an email list, you can also generate more traffic to your site through maintaining a relationship with your subscribers and inviting them over to your site. Gain direct referrals through online networking with referral sources like physicians, health workers, and other therapists. Google and other search engines can rank you and direct traffic to your site through marketing practice of SEO, or search engine optimization. Any community, in-person marketing, and online and offline networking efforts will tie back into driving traffic to your site. These efforts can influence both shares on social and travel via word-of-mouth. Various forms of paid ads can get traffic onto your site. Google ads and FB ads are the go-to for this marketing activity but there are also opportunities for paid sponsorships or content in online media. Getting into the media either by being asked for a contributor quote, writing a post, or writing a column can also drive traffic to your site including high-value backlinks which also help with SEO. Now that you have a beautiful, high-converting website, and you understand some of the basic activities involved in digital marketing, the next step is to create your own strategy. Strategy is what will take you from a private practice goal like, “I want to get 1 new client per week” to realizing that goal. Digital marketing strategy means working to discover and implement the methods that will ensure you are creating a sustainable private practice. Part of a winning strategy is the iterative process of discovery that helps you improve and refine your strategy as you go. If you are a digital strategy beginner, you won’t really know what is going to be the most effective way to market your practice on the internet. So the first step is research. Through both online research like googling terms to investigative conversations with colleagues, here are some questions to guide your inquiries. What marketing activities drive traffic? 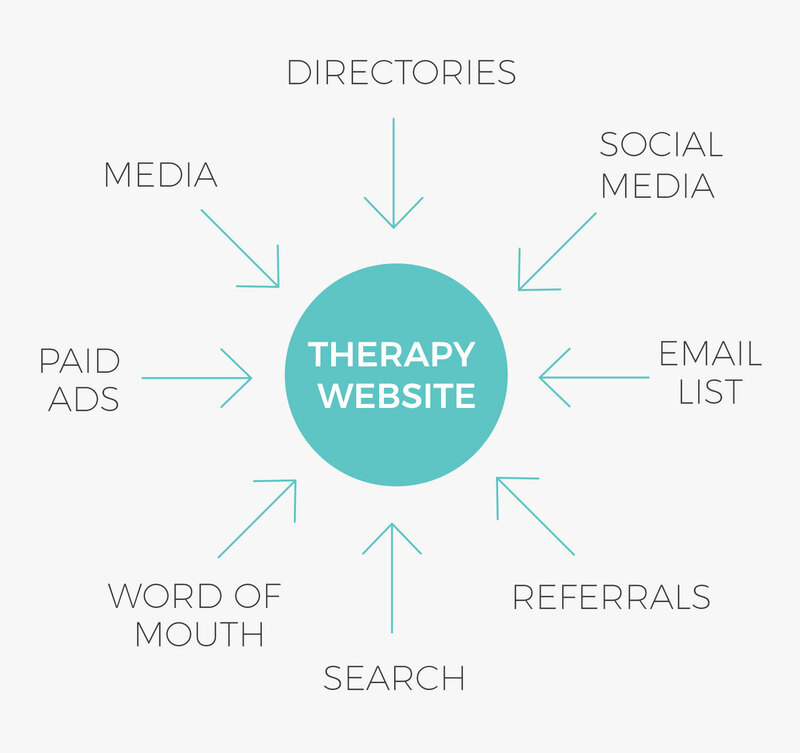 What marketing activities work for other therapists in my city? What marketing activities can I afford (time, energy, and money)? What marketing activities excite and interest me? What marketing activities are quickest for seeing results? The answers to these questions are different for every therapist as each therapist is unique in who they are, what solution they provide, for who they provide it, and where. Just like technology moves fast, so does anything digital marketing. The year or even month that you conduct this research may yield different answers as well. Remember that you are unique, so you may to be mindful to research to your inner space on this. Do the other research too and while you’re doing so see what is interesting and exciting to you. If blogging is something that’s working heaps for Dr. Sally down the street but you hate writing from the core of your soul, forcing yourself to blog anyway would be a bad idea. Or you might hear that hiring an SEO company can start getting you to rank higher in Google but it costs 2k per month. You could pay for it but doing so would dig into your vacation savings. Is skipping vacation the lifestyle that you wish to have? Instead, go towards the combination of activities that you’ve researched to work as well as activities that excite you and allow you to have the lifestyle that you desire. You are the one doing your marketing so it needs to fit you. In this example beginner digital marketing strategy, it gives you enough to start getting a foothold online. Content marketing like blogging or podcasting are ways to increase the value that you are putting out there, increase your authority in your specialization, and give your website value outside of being just a mere sales tool. Social media allows for both networking, being seen by referral sources, and for being found by your ideal clients. As you create more content from your content marketing activity, you’ll have more and more content that you can share and that can be shared on social media. This will increase traffic to your site. Most people don’t systematize their online networking efforts but you can and should. Just find one person per month that you believe could be a referral source and make a dedicated effort to connect with them over time. One of the overlooked ingredients to successful digital strategy for private practice therapists is learning which is a central piece of doing marketing well. Through free or premium resources, scheduling time to learn will improve your marketing skills. Most therapists will never have the budget for an in-house marketing team. You are the marketing director, and the content marketer, and the SEO, the social media marketer, and everything. You’ll need to wear many hats in your business so the more you learn, the better you are positioned to create your own digital strategy moving forward or hire someone else to on any level of strategy or implementation while truly knowing the value of their services. It’s hard to resist getting involved in a lot of different marketing activities at once. Especially when day after day you open your analytics and see your traffic is so low and you are anxious to start getting clients in the door. But spreading yourself thin across multiple activities is a recipe for burnout. Know that there are so many channels for connecting and only so many hours in the day so you’ll want to develop a sustainable digital marketing strategy that gets you results with your peace-of-mind intact. Most digital marketing strategies take time to yield results. Some take a ton of time, like getting search engines to rank you, others can be a much quicker, like networking online with an influencer that starts referring you, but all activities take probably more time than you think. So as Thich Nhat Hahn likes to say, “Smile, breathe, and go slowly” and with consistent effort, you will arrive at a digital marketing strategy that is sustainable and sustaining. You can do it. What do you think? What activities are you thinking of trying out in your first digital marketing strategy? Let me know what you think by reaching out or tweeting us anytime.